A glass manufacturing company wanted to know why a competitor was still in the glass business, as its glass business was losing money, and had been for several years. Their ultimate goal was to predict when this competitor would exit the glass business so they could capture the competitor’s customers. My goal was to learn as much as I could about the competing glass company, and most importantly why they were motivated to remain in the glass business. Most of the publicly held competitor’s revenue, and all of its profit, came from their food business. I had found out that the competitor was investing minimally in their glass factory operation, and hired many Spanish speaking immigrants to work in the less hot and less dangerous jobs. There were piles of scrap glass around the factory, but they didn’t bother hauling them away. It was time for the quarterly earnings phone call, and my client suggested I listen in. I almost didn’t as I figured I could read this later. However, something made me listen. The competitor’s CEO was all cheery when discussing the food business. Then an analyst asked, “And what about the glass business? What are you doing there?” “Ah…the glass business…well…,” uttered the CEO in a dejected and hesitant tone. Hmmm I thought, it sounds like the CEO is emotionally attached to the glass business. I researched and found out that the CEO’s Dad had bought the glass business, and surmised that he wanted to stay in it for that reason, not for revenue or profit. I called the analyst who had asked about the glass business to learn why he thought the company remained in the glass business, and what might cause the company to exit it. He agreed that the CEO was emotionally attached to the glass business. Thus, he was not likely to leave the glass business for any rational reason, else he would have already done so. These conversations and research gave me the insight to answer my client’s question: what would cause the competitor to divest or sell the glass business? While I couldn’t say when, I concluded that it would take a catastrophic event for the CEO to exit the glass business. It would have to be an event that was out of his control. I figured an accident in the factory or something that serious, could be a trigger. I recommended that my client should closely monitor the competitor since something was bound to push the company out of the glass business. Thus, my client closely monitored the competitor’s activity. The trigger was when a stockholder’s group filed a complaint and threatened to submit a class action suit against the company if they didn’t divest the money losing glass business. Bingo, this was the event my client was waiting for. They went after the competing company’s glass business. The time was right, and they were ready. All too often we rely only on written digital data. It turned out the CEO’s tone of voice in the competitor’s earnings conference call provided the pivotal clue. If I had only read the earnings report—my original intention—I would have missed it. My lesson learned: in competitive intelligence projects, when you can listen to the human voice, especially the company’s CEO, do so. I just had another client tell me he was getting pushback from his salesforce to do Win/Loss analysis. They felt threatened by what the output might be. They felt that win/loss analysis would be a critique of them, and only them. Really!? The objective of Win/Loss analysis is to win and retain more business, not to critique sales people. When you look at the detail under each of these 4 topical areas, only #1, Relationship Health is primarily a Sales’ assessment. The other three are NOT assessing Sales, and they are just as important to helping companies win and retain more business. Another way to help dispel the salesforce’s belief that Win/Loss just targets them is to share the strategic benefits that companies gain from Win/Loss. How could this be if we only assessed the salesforce? Which industry segments do and don’t like your solutions. What business to walk away from. Which business sweet spots to strengthen. New competitors, entering from industries different from yours. Strategic partners or acquisition candidates. Geographic markets to enter or exit. How to improve your product or service mix. New product and service developments. Sustainable ways to increase profits and revenues. Knowledge of disruptive changes before they hit the market or better yet, how to become a disruptor yourself. Win/Loss is not a critique of the salesforce. That’s your company’s management’s job! Win/Loss analysis’ objective is to learn how to win and retain more business—both in the short term and over time. Actually, your salesforce is the biggest beneficiary of Win/Loss analysis since your salesforce’s goal parallels the goal of Win/Loss analysis: to win and retain more business. Win/Loss lets your customers and prospects enlighten you from their entire buying experience with your company…and the competition. BTW, research indicates that companies who act from a formal Win/Loss program can improve business win rates anywhere from 15 to 30%. Can you afford not to be doing Win/Loss analysis? Win/Loss Analysis: definition, presentation, etc. Recently I was interviewed about Win Loss analysis. This is what happens when you write a book. I thought you might be interested. Question: Why did you write this book, Win/Loss Analysis? Ellen: There wasn’t a book written on Win/Loss analysis and every time I complete a Win/Loss project, and my client makes the changes that I recommend, they make more money. I want more people to do this work so they can improve their sales retention and win rates. Question: So what exactly is Win/Loss Analysis? How does it work? Ellen: You interview your customers and those who chose a competitor about two or three months after the sale. That way they know you’re not selling to them. You’re listening. You want to learn why and how they made their buying decision, and how things might have changed during the buying process. Customers are very good about telling you what’s on their mind once they notice you’re actively listening. Question: What is the most compelling reason for people to do Win/Loss analysis? Ellen: The most compelling reason is that those companies who have a formal Win/Loss program can improve win rates 15 – 30%, if they act on the changes that are recommended. Question: What size companies do Win/Loss analysis? Is there a certain threshold of revenue, employees or customers you need to hit before it’s relevant? Ellen: It’s relevant even for a one person shop. Case in point: a gentleman who read my book runs a photography and video business. When he asked a loss customer “What did I do wrong? How can I improve?” and other questions, they were so impressed with his professionalism that he got three referrals. Of course, it’s more involved at a large company since you have politics, culture and so much more to deal with. Question: If Win/Loss is so successful, why don’t more companies do it? Ellen: The biggest reason is arrogance. Some companies don’t know about Win/Loss analysis. Others are uncomfortable with it since their sales force feels like they’re being picked on. Actually the sales force is a major beneficiary of Win/Loss. And besides they aren’t the only ones being assessed. We look at marketing, product development, R&D, and the company’s reputation. Question: What skills does it take to be successful at Win/Loss analysis? Ellen: Organization and being a good listener. Interviewing requires you to be a good listener. You need to be very organized before you conduct interviews. It’s a people business, and you have a limited time to conduct each interview. Question: Is there a bigger payoff in focusing on wins or losses? Ellen: I think it’s best to focus on both since they share different things. Wins will share what you’re doing right, but they’ll also tell you what the competition is saying. Often they’ll tell you more than losses will. It’s only human nature since they decided on your company’s solution. Wins will also tell you about your company’s implementation, customer service, etc. Losses will tell you how you’re perceived in the marketplace, and you’ll often find out that you’re perceived differently than you thought you were. People buy based on perception. Question: Is Win/Loss a tactical advantage for companies or do they also use it for some strategic reasons? Ellen: Most of it is tactical in that sales and marketing benefit most immediately. Product development also can benefit. For example, sometimes you find out about unintended uses of your product or service and you can go after a new market segment. We used it at Bell Atlantic (Verizon subsidiary) many years ago to affect a strategic acquisition. Question: What are the pros and cons of outsourcing Win/Loss? Ellen: The biggest pro is that customers and those who chose a competitor will tell a Third Party more than they tell company employees. They don’t want to share bad news with the company. Consultants do this for a living and have more practice conducting Win/Loss interviews. The major con is cost. Also, nobody know your business like you do. If your employees conduct the interviews, there is less cash outlay for a Third Party. However, this will take your employee’s time away from other projects. Question: Are there other tips you would like to share for someone starting a Win/Loss program? Ellen: Have it be a collaborative effort with your sales force. Sales is out there in real-time all the time. Get Sales’ input on what would be good questions to ask, and which customers might be most apt to share. However, don’t let them conduct the interviews. Make sure you act on the changes from Win/Loss analysis. If not, you have wasted your time. Question: Who do you target your book to? To those who would hire you or those who want to conduct their own Win/Loss? Ellen: To both, and also to consultants who want to add Win/Loss analysis to their portfolio of services. The book is available as a hardcover, paperback or e-book on Amazon. For a personally signed copy or volume discount (>5), please contact Ellen directly via phone/text at 720-480-9499 or email: Ellen@EllenNaylor.com. Read more about Win/Loss analysis. 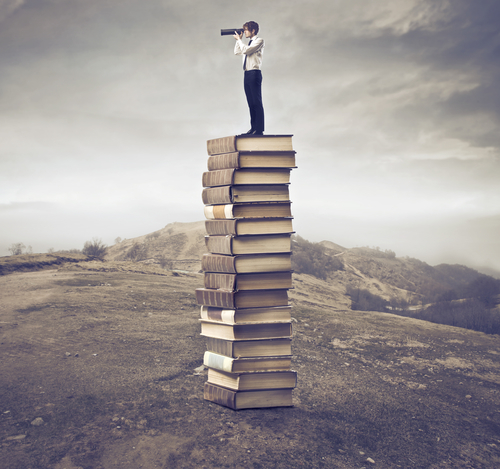 Four of the top 7 competitive intelligence blogs were written in 2009. 2 were competitive intelligence analytic tools, which the other 2 were relationship skills: emotional intelligence; and marketing, R&D and product development relationships. These topics are timeless. 1. Templates for Win/Loss Analysis – The Win Loss request I get asked the most often is, “Can you share your Win Loss templates?” I break down Win Loss analysis questions into 4 buckets: relationship health, company reputation, product/service attributes, and servicing issues. 2. How a Good Relationship between Marketing and R&D Improves Product Development – When both marketing and R&D focus on understanding and acting on customer needs, it makes their jobs easier and their results more productive. This is a powerful competitive weapon since this is not the case at many companies. Perhaps R&D can be masters of the Art of Possibility while Marketing can master the Art of the Possible – that is what your customers want and are willing to pay for. 3. Sharpen Your Emotional Intelligence Skills – In competitive intelligence, strong emotional skills are essential since we’re often delivering bad news to management or threats to the business, which causes stress since they don’t want to hear it, even if it is the truth. Be sensitive as to how management will react to our news and analysis, and don’t spring surprises. What’s neat about EQ versus IQ, is that we can learn and be coached to improve our EQ skills. 4. How You Can Become a Conversation Rockstar – So much about life revolves around effective communication. As a primary researcher, I look for ways to motivate people to share. You need to understand what makes them comfortable to share with you. One source I read in 2016 is Traci Brown’s book, Persuasion Point: Body Language and Speech for Influence. While the book focuses on closing sales, the same tactics will work to promote sharing when conducting competitive intelligence collection or Win Loss interviews. 5. 7 Timeless Competitive Intelligence Tips – Here are a few: Company insularity is not a competitive advantage. Don’t forget that your employees are smart. What ever happened to good old fashioned customer service? Let employees create and have access to customer, sales and market intelligence. 7. BCG Matrix Study: A Visual Strategic Competitive Intelligence Tool: Explanation and Case Study – Use the BCG Matrix to visually depict a share of market snap shot among competitors. I have worked in competitive intelligence for over 25 years and here are some timeless key findings. 1. 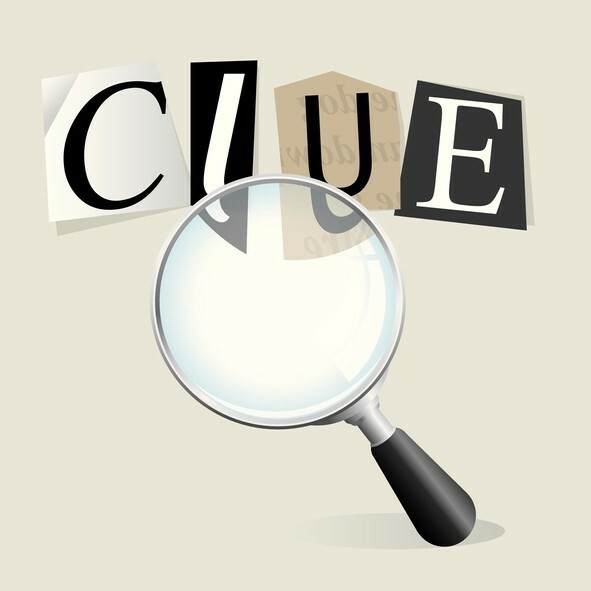 What Is Competitive intelligence Anyway? Competitive Intelligence is NOT competitor spying. While competitors are definitely part of the external scanning and analysis process: customers, suppliers, regulators, new technology and so many more sources are part of the competitive puzzle. 2. Company Insularity Is Not a Competitive Advantage. Too many companies spend too much time being insular since it is comfortable and are encouraged by executives who want to do it their way. Unfortunately many companies compensate their executives to be low risk takers since they get paid very well whether the company is doing well or not. 3. Don’t Forget: Your Employees Are Smart! Yet, you don’t want to be too focused on the external environment so as to disregard what your employees are telling you. You don’t want to stifle their creativity by saying it won’t work, since it didn’t before or at company X. You want to give employees adequate time to be creative and exploratory, and to make allowances for mistakes: not just in research and development. 4. Let Employees Create and Have Access to Customer, Sales & Market Intelligence. Customers are a key source for product development, competitive intelligence and the future of your marketplace. Don’t assume you know what your customers want: ask them. I notice that the the most successful companies are good at figuring out what will delight their customers–which goes far beyond “asking them”. This comes from letting the brains in the company be creative and develop neat products and services. Yet they need to have a tie to customers and other external sources to feed their creativity while internal marketing and sales people help them with practical things like pricing. 5. What Ever Happened to Good Old Fashioned Customer Service? Many companies fixate on innovation at the cost of good customer service around existing products and services. One key learning from many Win/Loss interviews with customers is that customer service and company reputation are often the reasons customers buy and stay with you. Innovation and pricing are almost always lower in the decision-making totem pole. In a similar vein, some companies seem more eager to steal competitor’s customers than to retain their own. Costly move. 6. Many Companies Can’t Afford a Competitive Intelligence Process. If your company doesn’t have the budget to sustain a competitive intelligence process, at least establish and maintain a list of internal and external experts who you can rely on when you have those competitive intelligence quick turnaround projects. Realize the value of cross-functional input towards key decisions, as cross-discipline output will reduce blind spots in your strategy. Input from external resources, who have never worked at your company, also reduces blind spots. I have noticed that most companies actually have the intelligence they need about their marketplace to make smart decisions: they just aren’t willing to make the changes. Being nimble and willing to make organizational, product or service changes is a competitive advantage. Don’t get bogged down in organizational practices and procedures that aren’t necessary. Having management that is incented to make these changes is also a competitive advantage! Extra Tip: Learn Why Your Competitors Got the Business that You Didn’t. Earlier this year, I was honored to give a Win Loss analysis webinar, as part of the competitive intelligence #IntelCollab series facilitated by Craig Fleisher, Chief Learning Officer at Aurora WDC. You can view the slides and listen to the webinar entitled: Win/Loss Analysis Captures and Keeps New Business. You will get a preview of my recently published book, Win/Loss Analysis: How to Capture and Keep the Business You Want. What percent of Win Loss analysis interviews are blind versus not-blind? First let me explain the question. A blind interview means that the interviewer does not identify the company who hired him or her to conduct the Win Loss interviews. Not-blind Win Loss interviews mean that the interviewer discloses the name of the company who is conducting (or the recipient of, if outsourced) the interviews. I suspect that most B2B Win Loss interviews are not blind as it is more professional to be upfront about the company who wants the information. It is another touch-point with your customer or potential customer, in the case of losses. I have found that for every 2o Win Loss interviews I conduct, I find one lead for my client’s sales reps. This wouldn’t happen were it a blind interview. Trust needs to be earned when interviews are blind. You need to offer those you interview something in exchange for not disclosing the company’s identity. This is not necessary when you are open about the hiring company. You also get on the same page sooner when you share the company’s identity. When you don’t, those you interview will be trying to guess who hired you to conduct the interview. This is just human nature. I think it’s playing games not to disclose the hiring company when I conduct B2B Win Loss interviews, which is what most of them are. That said, there are companies who specialize in conducting Win Loss interviews that are blind. I suspect they are a minority. I am not one of them. Do you have a horror story to share about a Win Loss interview that went badly? Do you have tips on how to deal with this? The worst thing that will happen is they will hang up on you, although I have never had that happen. These are warm calls, so there is a low risk that things will go wrong. Win Loss interviews are not cold calls, where the person has no idea who you are, when you’ll be calling or what you’ll be calling about. In Win/Loss interviews, you have a warm introduction to the person you’ll be interviewing either directly from Sales or an introductory email that explains why you want to connect with them, giving them some good reasons why they would want to talk with you. The closest thing to disappointment is that more people don’t agree to Win Loss interviews or they forget about our scheduled interview time. My biggest disappointment has come from a company who hired me to conduct Win Loss analysis. When I called the Sales person to find out more about their account before calling their customer, and I realized that their sales management hadn’t told them word one about this Win Loss process. They had no idea what it was, that management had agreed to this process, what was in it for them, and that they were to cooperate with me. You mentioned that you use a decision tree approach to developing the Win Loss questions. How do you prepare them? Do you share with the sales force to validate it? I don’t share my decision tree with my clients. They don’t care to see this level of detail. They just want results. I develop the decision tree approach especially around areas where I need to learn more before I conduct the Win Loss interviews. Examples might be technology or a manufacturing process. I would need to learn all the innuendos of the technology that might impact a decision to buy the customer’s product. I learn enough about the technology to probe deeper and deeper depending on how the customer might answer the questions. For example, I might learn all the technical features, training on how to use it, and the strengths and weaknesses the marketplace perceives about this company’s technology. The decision-tree is thinking and plotting all the different ways that a customer could possibly answer my questions, and what questions I might pose depending on how they answer. Not only does this process give me ammunition to probe more deeply. There are fewer surprises in these interviews since I have done my homework. They run more smoothly. Another example is decision-making criteria. It could be based on price, features, customer service, ease of use, compatibility with the customer’s other technology, company reputation/longevity, account rep, professionalism, or what others are saying about the company (industry consultants, other customers, Wall Street). Usually there are several factors at play, and if you do your homework, you’ll find out which are the most important ones and why. To learn more about how to conduct your company’s Win Loss analysis, check out my book: Win/Loss Analysis: How to Capture and Keep the Business You Want. 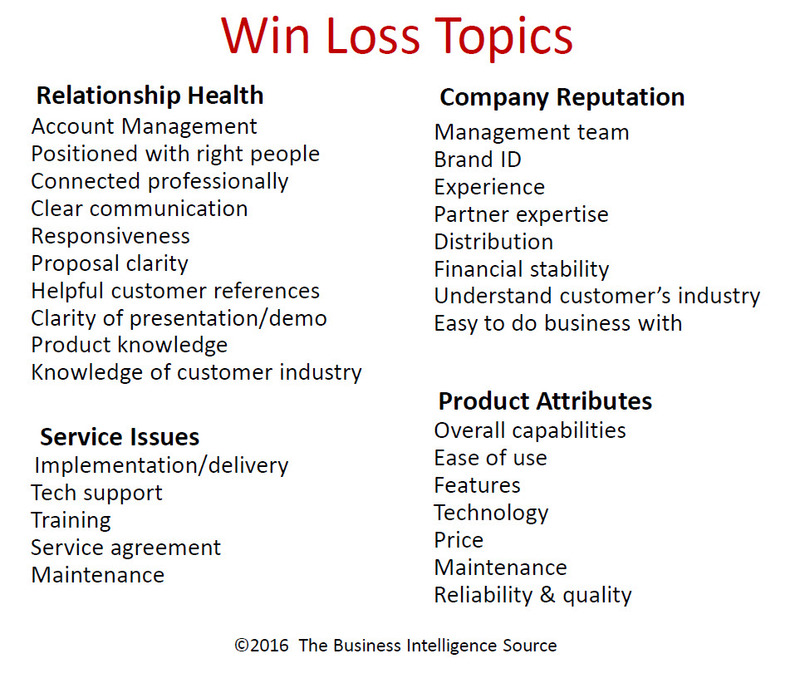 In May, I was honored to give a Win/Loss analysis webinar, as part of the competitive intelligence #IntelCollab series facilitated by Craig Fleisher, Chief Learning Officer at Aurora WDC. Since people often disconnect for Q&A, I am including them in this blog. What internal group supports Win/Loss programs in your experience? If it’s not competitive intelligence (CI), as not all companies have a CI person or team, it’s usually a manager or executive in business development or marketing. What are some of the best practices to break through internal company resistance to Win/Loss analysis? First, only one part of Win/Loss analysis targets sales performance and professionalism as you’ll see in the Win/Loss topics chart below. Other areas include product attributes, service issues and company reputation. Sales also is motivated to cooperate from this Win/Loss statistic: taking action from a formal Win/Loss program can improve win rates from 15 – 30%. On the other hand, know that Win/Loss isn’t for every company. 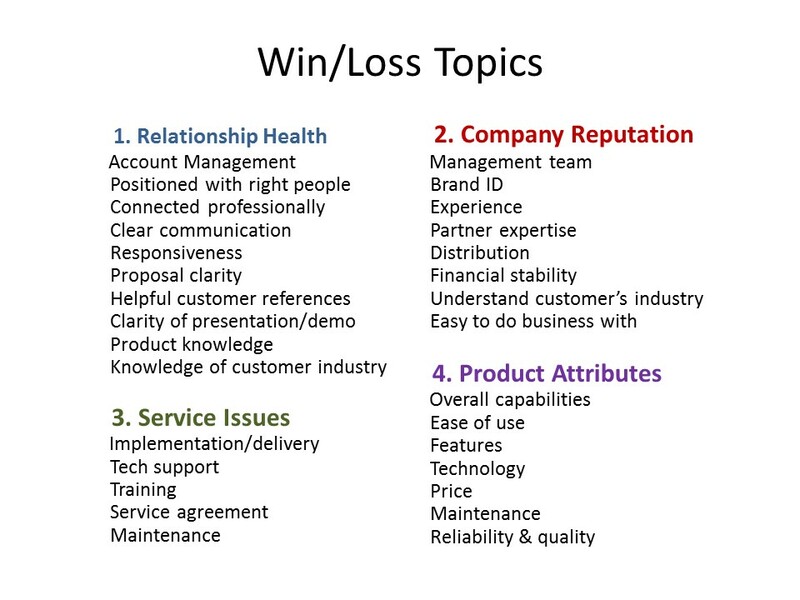 As mentioned in the webinar, some companies have never heard of Win/Loss. Some think they’re doing it when they’re not. Others are going through the steps of Win/Loss, but aren’t making any changes from the results. Some are stymied by politics and/or arrogance to seriously consider a Win/Loss program. When is the best time after the buying decision to conduct Win/Loss analysis interviews? Ideally it’s 2 to 3 months after the buying decision has been made, and people know you aren’t selling to them. If you wait too long, people forget the details of their buying decision, and sometimes they move onto another position within the company or leave the company. Sometimes I have great interviews when the decision-maker has left the company and I listen to the person who has been forced to adopt the solution or product. While I don’t learn about the decision-making process, I do find out how well the product is working, often in much more detail than I would have from the decision-maker. Due to the sensitivity of Win/Loss analysis, is it better to hire a third party? First of all: if you conduct the interviews in-house, don’t have sales people do them. Customers don’t want to deliver bad news to sales people: it’s just human nature. You want to hear everything. Although it’s great to have sales people pave the way for whoever is conducting the Win/Loss interviews. In more complex deals, sales people might even be present for the Win/Loss interviews, but I would have someone else be the key interviewer. Marketing or Product Developers can conduct these interviews since they often have the product knowledge and the bigger picture of where your company wants to go. However, many of them are not expert interviewers, as this is just a small part of their job responsibilities. Third parties are often preferred for two reasons: they are a neutral source so customers and those who chose a competitor feel more free to share; Win/Loss consultants are expert interviewers since this tends to be their full-time job. Their focus is customer intelligence. Don’t ask me why, but I find that when I conduct Win/Loss interviews, people are happy to share the good, the bad and the ugly with me, even though they know that my client is the recipient of all this information (although I do not disclose the names of the individuals interviewed). I will include the next 5 questions in a future blog or on my LinkedIn blog. To learn how to build your company’s Win Loss analysis program, check out my book: : Win/Loss Analysis: How to Capture and Keep the Business You Want.